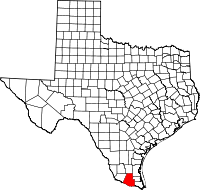 Hidalgo County is a county in the U.S. state of Texas. The county seat is Edinburg and the largest city is McAllen. The county is named for Miguel Hidalgo y Costilla, the priest who raised the call for Mexico's independence from Spain. It is located in the Rio Grande Valley of South Texas and is one of the fastest-growing counties in the United States. As of the 2017 census, the population was 860,661, making it the eighth-most populous county in Texas. Hidalgo County is designated by the U.S. Census Bureau as the McAllen-Edinburg-Mission Metropolitan Statistical Area, which itself is part of the McAllen-Edinburg-Mission-Rio Grande City Combined Statistical Area with neighboring Starr County. According to the U.S. Census Bureau, the county has a total area of 1,583 square miles (4,100 km2), of which 1,571 square miles (4,070 km2) are land and 12 square miles (31 km2) (0.8%) are covered by water. The northern part of the county has sandy and light loamy soils over deep reddish or mottled, clayey subsoils. In some areas, limestone lies within 40 inches of the surface. The southern part of the county has moderately deep to deep loamy surfaces over clayey subsoils. Along the Rio Grande, brown to red clays occur. Hidalgo County is in the South Texas Plains vegetation area, which features grasses, mesquite, live oaks, and chaparral. Native plants, reduced in recent years by extensive farming, include chapote, guayacan, ebony, huisache, brasil, and yucca. In 1982, 91% of the land was in farms and ranches, with 52% of the farmland under cultivation and 85% irrigated; 51 to 60% of the county was considered prime farmland. The primary crops were sorghum, cotton, corn, and vegetables; Hidalgo County led Texas counties in the production of cabbage, onions, cantaloupes, carrots, and watermelons. The primary fruits and nuts grown in the county were grapefruit, oranges, and pecans. Cattle, milk cows, and hogs were the primary livestock products. Natural resources included caliche, sand, gravel, oil, and gas. Oil and gas production in 1982 totaled 98,487,211,000 cubic feet (2.7888472×109 m3) of gas-well gas, 139,995 barrels of crude oil, 1,101,666 barrels of condensate, and 15,784,000 cubic feet (447,000 m3) of casinghead gas. The climate is subtropical and subhumid. Temperatures range from an average low of 47 °F (8 °C) in January to an average high to 96 °F (36 °C) in July; the average annual temperature is 73 °F (23 °C). Rainfall averages 23 inches (580 mm) a year, and the growing season lasts for 320 days of the year. As of the 2015 Texas Population Estimate Program, the population of the county was 841,667, non-Hispanic whites 62,232 (7.4%). Black Americans 2,973 (0.3%). Other non-Hispanic 11,106 (1.3%). Hispanics and Latinos (of any race) 765,356 (90.9%). Hidalgo County tends to vote for the Democratic Party, although there is representation of the Republican Party in some of the offices that affect the county. Hidalgo County is represented by Vicente González of Texas's 15th congressional district, and Henry Cuellar of Texas's 28th congressional district. In the 2012 presidential election, 70.4% of the voters voted for Barack Obama while 28.6% voted for Mitt Romney. The last time Hidalgo County voted Republican was in the 1972 presidential election when Richard Nixon won over 55% of the votes. The Hidalgo County Sheriff's Office (Texas) operates jail facilities and is the primary provider of law enforcement services to the unincorporated areas of the county. ^ "Hidalgo County". Texas Almanac. Retrieved Nov 23, 2011. ^ Bloch, Matthew; Jason DeParle; Matthew Ericson; Robert Gebeloff (November 28, 2009). "Food Stamp Usage Across the Country". New York Times. Retrieved November 28, 2009. ^ a b "Table 1. Annual Estimates of the Population of Metropolitan and Micropolitan Statistical Areas: April 1, 2010 to July 1, 2012". 2012 Population Estimates. United States Census Bureau, Population Division. March 2013. Archived from the original (CSV) on 2013-04-01. Retrieved March 20, 2013. ^ Garza, Alicia A. "McCook, Texas". The Handbook of Texas. Retrieved July 14, 2009.